Happy Friday!! :) Words can't describe just how much I love this top! The sleeves are my definition of perfection. 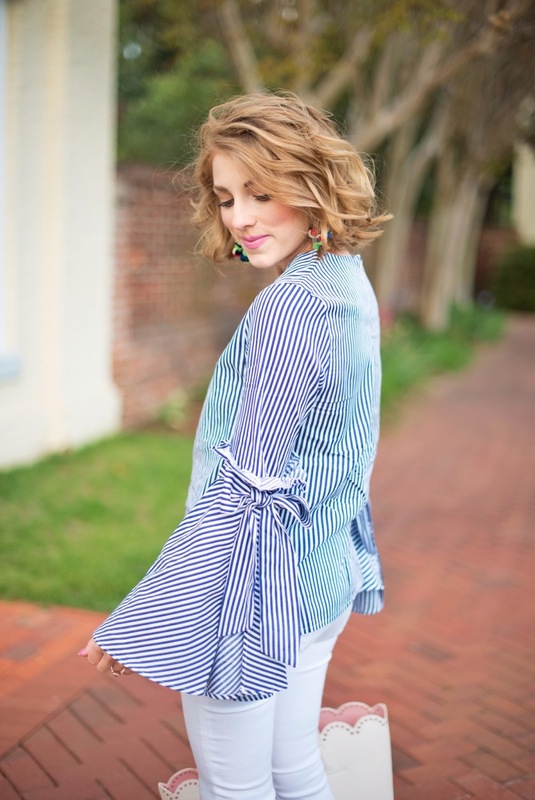 A combination of blue and white, stripes, bell sleeves, ruffles and bows? I'm obsessed! I love how perfect it is for spring. 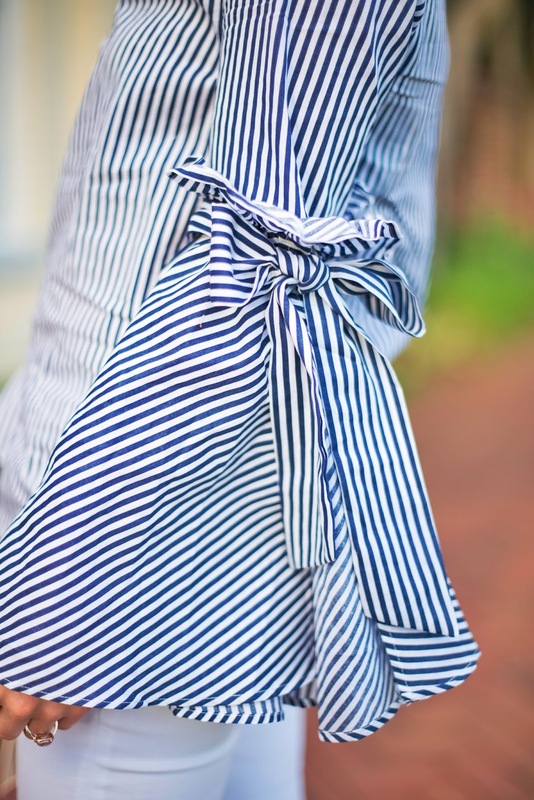 It is under $50 and also comes in pink and gingham. I'm wearing a size XS/S for reference. It is definitely a top you want in your closet. I also love the way it looks paired with these under $100 suede sandals. I have gotten SO much wear out of these blue beauties (maybe because I wear so much blue and white haha?). They also come in black and tan. And lastly, this scallop tote is absolutely darling, if you ask me. I love the perforated scallop details with the blush lining. 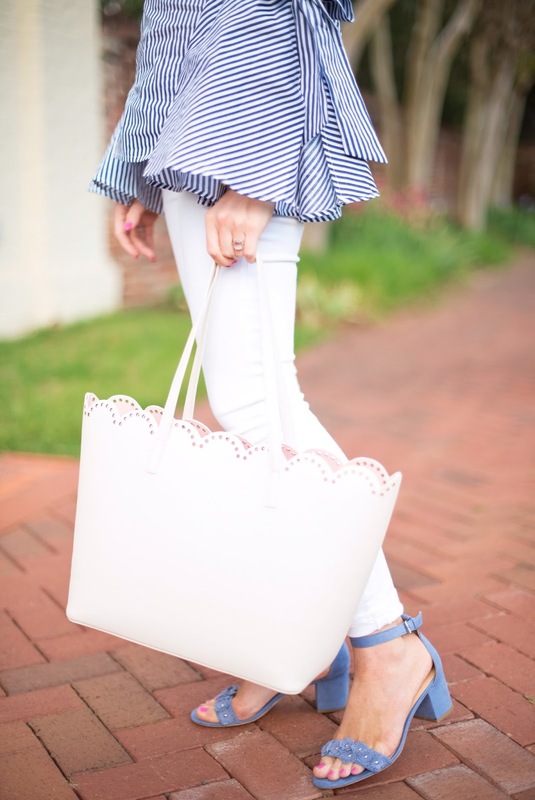 So many pretty little details in this under $50 bag. It is currently available in two other colors. Okay that's enough of my outfit ramblings for today! I hope y'all are gearing up to have a great weekend! Even though I'm (suppose) to be on spring break, I have a research paper due Monday that I have got to buckle down and finish this weekend. But first there's a fun little day trip planned for today with my two favorite girls, my Mama and Madeline. What do y'all have planned for this weekend?